Funny, but my desk is actually pretty tidy for WOYWW this week, but what is my desk shot of the week only shows a tiny bit of what I’m focusing on. You can’t read it but it’s a little scrap of paper that says 1 part paint, 1 part talc, 1/2 part glue. And you see those very things assembled. 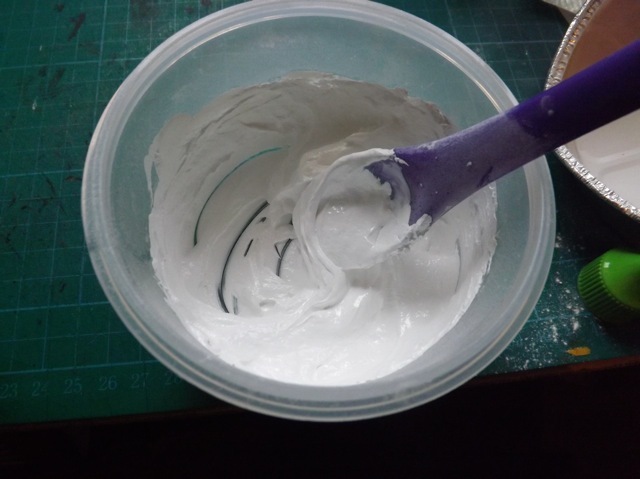 at some point I found a recipe for homemade modelling paste, jotted it down, then it got buried under a ton of suff on my desk! This week, while doing a good tidy, I unearthed it and made it. and dries actually pretty quickly. Nice I can mix up a bit any time I need it. Locally I can only get small tubes of modelling paste and it isn’t cheap. This stuff I have around anyway. And it is very flexible, so no worries it might flake off! Very cool! I’m glad to see how well it worked. Also, enjoyed your Newer post about adding color. The acrylic paint definitely is the stand out! Although sometimes a more muted effect is nice too. Thanks for sharing your experiment with us. I’m slowly getting around to WOYWW posts. I knew it would be sporadic until I have a bunch of free time (hopefully tomorrow) to visit. Hi Maryann, I must give that paste ago, Dede and I made some ink refresher and stamp cleaner and it works a treat at a portion the cost I think I will have to give this ago now. Thanks for sharing. Sorry I didn’t get to reply to your post yesterday the weather cut off all internet and I was on the road with work, so frustrating when i wanted to visit my favourites like you. Hope you have a great week, Oh love the coloured version of the paste too. As for Fred the tree – I hadn’t thought about decorating him throughout the year but I DID get some very cool skull ‘fairy’ lights for Christmas…. hmmm! Think I need to copy this down and use this. Brilliant! Thanks for sharing. Right, just tried it! Had odd looks as I ran into the kitchen shouting “ooh, ooh…” grabbing an empty yoghurt pot from the recycling and a spoon and running back up stairs shouting “where’s the talc?”!! So, tried colouring it with alcohol inks (bottle, eggplant and pitchblack) and it turned out the most delicate shade of very pale pink!!! I have used cheap PVA glue so when its dry (probably tomorrow as its getting late) I will have a look and see if its stuck, flexible etc!! Will be interesting to see what Shaz’ experiments with it works out as too. oh, oh. oh…..(whilst pointing at screen)…thats just BRILLIANT! 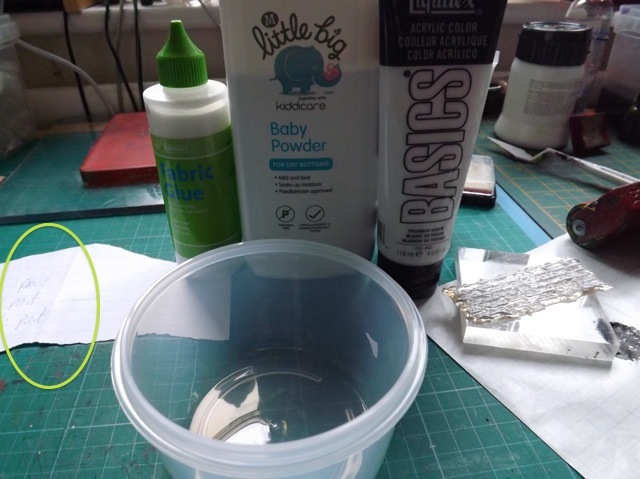 Have ordinary powder and some cheap PVA so will try that and see if it works! Oh my, you are my new craft goddess. I use so much Artist spackle and it costs so much. Well not any more. Thank you for sharing this. Back again, this time to answer your question about the file folders. Each is cut in half LENGTHWISE, and I used them to make my Craft Barn challenge pieces, as well as my Journal 52 entries. That makes them slightly larger than 8.5 inches X 11.5 inches. I made several books using file folders at Christmas, but for those, I cut them in half WIDTHWISE. That made them about 17 inches X ~6 inches when laid flat. 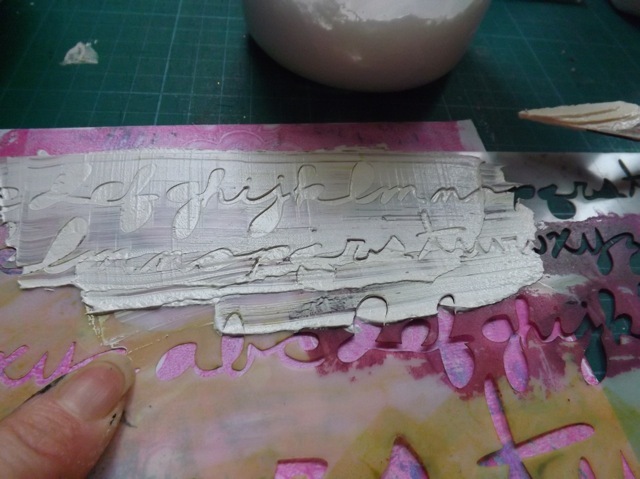 Each of the “pages” was part of a signature and each had 4 surfaces to decorate. Sorry these measurements are not metric, but I’m sure you can figure out the sizes. I don’t call them “manilla” folders, either, but some people do. I got mine from my friend who emptied all her files when she retired. I also raided my own supply from my consulting business. I bought mine at a big box office supply store. Can’t imagine you don’t have those in GB. I’ve even seen them at my local warehouse store (the one you [actually my friend] pay membership to visit). File folders are wonderful. They accept paint like you wouldn’t believe and still stay soft and supple. Even when they are old and battered, the paint actually straightens them and keeps them soft. I’ve got many examples on my blog, but have never actually labeled the examples with “file folders,” which I should go back and do. However, a blog search should turn up many examples. Thanks for asking. Oh, now that is clever and so very useful. Thanks for posting. Love that it smells of baby powder too. Hey MA. That paste looks seriously looks great please post the full recipe as like you say it is quite expwnsive and I find it goes hard in the tub too. Janet @30 finally found out how to comment on my phone yay! I saw The Frugal Crafters caulk version, but I just HATE the smell of that stuff. THIS smells much better to my nose. That makes it worth doing for me. 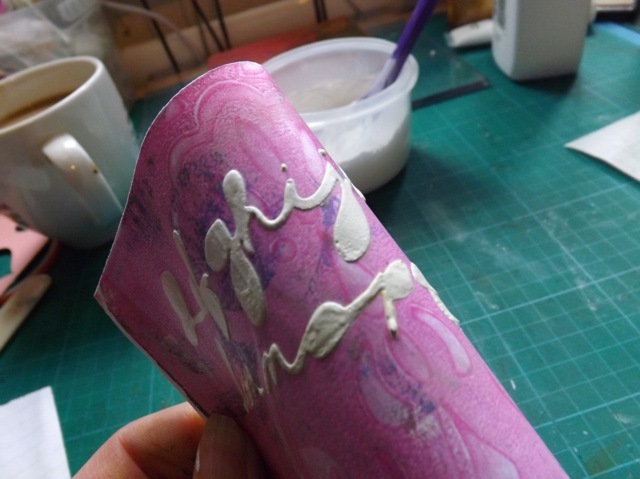 You can’t mix in stuff like glitter or mica (the shine dulls – which is, I think, pretty much the same as regular modelling paste) but you can colour it with alcohol ink. Too much liquid paint would change the consistency of it. I don’t see why you couldn’t mix up a tablespoon or two with a colour instead of white if you needed it. Maybe even mix it in a food bag and tie a knot in it? Then you could snip the corner when you needed that colour again. I bet it would stay moist for a long time with no air in there…. Now that is a rather brilliant idea. We go through pots of texture paste and it’s not cheap. I am going to try that! How totally brilliant. Thank you and Happy WOYWW! Well I never! What a great way to make an alternative product. And flexible too, huh?! Seriously, that is such a great tip, well done for finding the original ‘recipe’. Now that is a super recipe and a very good result. So now there is a little piece of paper on my desk as well. Thanks for sharing this … Love it as it’s simple and works! Oh Mary Anne, I am so going to try this tomorrow! Thank you for sharing, and Happy Woyww to you! Now I must try this. I need to buy baby powder while I’m out, but I have glue and paint. What an inexpensive way to make this EXPENSIVE paste. Thank you, thank you. No number yet, because I’m early again. thanks for the recipe. anything to save some $$$ these days.